Obama: Rise "of a strong, prosperous China can be a source of strength"
Tokyo, Japan (CNN) -- Touting himself as America's "first Pacific president," Barack Obama called on his own connections with Asia Saturday as he pledged a renewed engagement with Asia Pacific nations based on "an enduring and revitalized alliance between the United States and Japan." The U.S. president, in his first Asia trip since taking office in January, told a packed house at Tokyo's Suntory Hall that all Americans should know that what happens in Asia "has a direct effect on our lives at home." "This is where we engage in much of our commerce and buy many of our goods," he said. "And this is where we can export more of our own products and create jobs back home in the process. "This is a place where the risk of a nuclear arms race threatens the security of the wider world, and where extremists who defile a great religion plan attacks on both our continents. And there can be no solution to our energy security and our climate challenge without the rising powers and developing nations of the Asia Pacific." Obama met with new Japanese Prime Minister Yukio Hatoyama Friday after his arrival in Tokyo as well as with the Japanese emperor and empress. Obama touched on nearly every part of the Asia Pacific region during his speech, and talked about a boyhood visit to Japan with his mother, his birth in Hawaii, a childhood spent partly in Indonesia and the United States' position as a Pacific nation. "There must be no doubt: as America's first Pacific president, I promise you that this Pacific nation will strengthen and sustain our leadership in this vitally important part of the world," he said. He stressed that the United States was not interested in containing the emerging economic growth in China. "The rise of a strong, prosperous China can be a source of strength for the community of nations," he said. 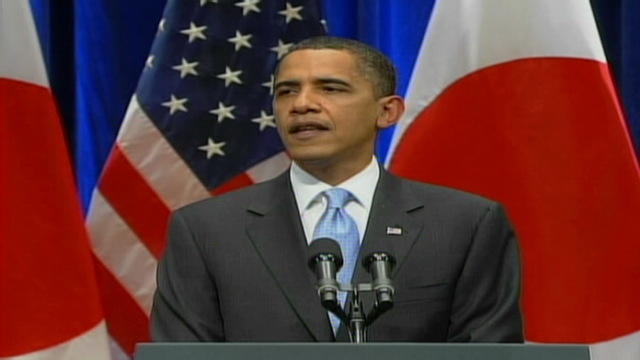 "And so, in Beijing and beyond, we will work to deepen our strategic and economic dialogue." Obama also called on Myanmar to make more definitive moves toward democracy, including releasing all political prisoners; urged North Korea to return to the Six-Party Talks so that the reclusive nation could be reintegrated into the world stage and pledged America's support for eliminating nuclear weapons and efforts to reduce the global effects of climate change. His trip is to include stops in Singapore, China and South Korea, during which Obama will hold formal talks with Asian leaders as a group and individually. The president plans to meet with Chinese President Hu Jintao and Premier Wen Jiabao, Singapore Prime Minister Lee Hsien Loong, South Korean President Lee Myung-bak, Russia President Dmitry Medvedev and Indonesian President Susilo Bambang Yudhoyono, and will take part in the Asia-Pacific Economic Cooperation summit. APEC's 21 member nations represent more than half of the world's economic output. The forum sees its goal as "facilitating economic growth, cooperation, trade and investment in the Asia-Pacific region." During a busy day in Singapore, Obama also will become the first U.S. president to take part in a summit of the 10-member Association of Southeast Asian Nations (ASEAN) economic alliance.